I bet a lot of you are scratching your heads at this one. Stone apples? What? I bet some of you are thinking that I made it up. Stone apples don’t really exist. But you know what? They do. They really really do. And I had one. Or, um, parts of one. Stone apples are called that because the fruit is inside of the, er, stone. Which is really just a very very hard outer hull. I knocked on it with my knuckles and, yep, it feels like stone. Bizarre, right? Stone apples are also called wood apples, but here, wood apples are a whole other fruit, I kid you not. I’ll tell you about those another time. 🙂 Stone apples are also called beli in Sinhalese. In the above picture, you can see two whole stone apples on the plastic bag with the outer shell of an already-emptied stone apple shell. Another piece of empty shell is near the bowl at the bottom. I was told that the apples are steamed before opening – my mother in law did that in Kurunegala before they came. Unsteamed, the fruit is raw and bitter. Steamed, it’s much better, although it still has a bitter aftertaste that I wasn’t that fond of. Fahim and his parents, though, like the bitter aspect of the fruit. 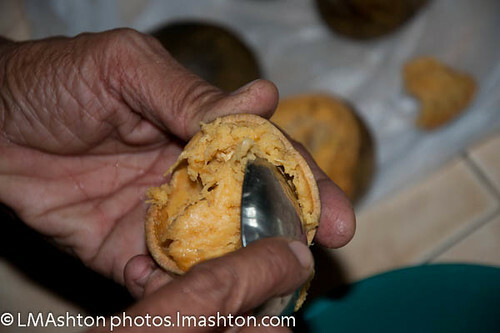 The pulp is scooped out of the, er, shell. 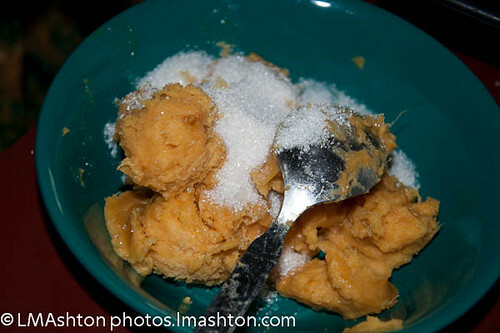 Sugar is added – about 1/4 cup or so to four stone apples – and then the fruit is mashed. Some people, I’m told, will use a blender to make it more smooth. It’s then eaten. 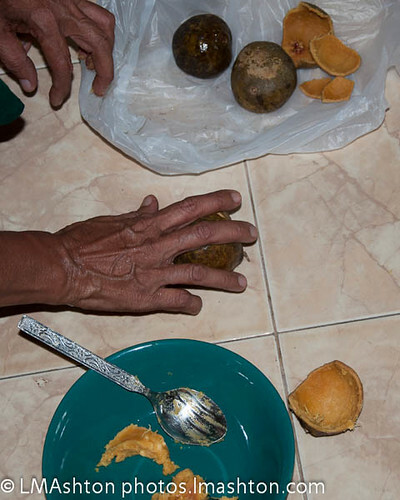 Alternately, the stone apple fruit, with the sugar, can be made into a juice with the addition of water or water and other juices. Lemon or lime juice added to the juice is very very nice. 🙂 I’ve had it that way, as a juice, and rather enjoyed it. The flavour is reminiscent of peaches. From the health perspective, beli is a clear winner. Everything, from the bark, roots, leaves, flowers, and fruit, are used for medicinal purposes in Ayurveda. Have you had beli? In what form? What did you think of it? 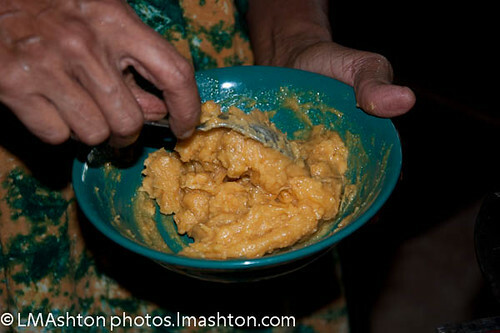 Beli is delicious mashed and as a juice. From what my grandmother tells me it’s also quite strange, it doesn’t take very good if it is plucked from the tree, only the fruit that ripen and fall naturally tastes good. I really appreciate this recipe you have shared Laurie this is odd, all i know that stone apple are sweet enough so maybe it is okay not to put any sugar, but i will try this recipe of yours.